Home > Departments > Faculty > Heather L. Roberts Ph.D.
Heather L. Roberts earned her Ph.D. in English from Cornell University with a specialization in 19th Century American Literature and concentrations in Women's Literature, African-American Literature and Native American Literature. She also has an M.A. in English from Cornell and a B.A. in English Literature from Yale University. Dr. Roberts has taught English at both the college and secondary school level for eighteen years. Her interests include literature and writing, developing critical literacy across the desciplines, school-university partnerships, collaborative K-16 curriculum development, and urban school reform. Dr. Roberts's clinical work is focused at the secondary level. She works primarily with English and Foreign Language pre-service teachers at secondary schools within the Hiatt—Main South Secondary School Collaborative. She regularly facilitates an on-site seminar for student and mentor teachers at South High School and co-chairs Hiatt Center K-16 curriculum teams in literacy and the humanities with teacher colleagues. She also regularly teaches English seminars for 11th and 12th graders at South High School and the University Park Campus School, and currently co-teaches a seminar on "Best Practice" for teachers and staff members at the secondary Claremont Academy. Her present research focuses on developing effective university-high school partnerships and supporting secondary students from Clark's Main South community in their transition to college. She has been centrally involved in laying the groundwork for Clark University's deepening partnerships with South High School and the Claremont Academy and in expanding Clark's long-standing and highly successful partnership with the University Park Campus School. 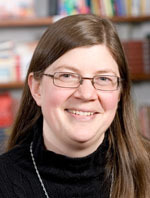 She will be co-presenting a paper on this work entitled "When the Community is a School: Stategies for Partnership Success," at a CITA conference on University-School Partnerships at the University of Massachusetts, Lowell last April. "'The Public Heart': Urban Life and the Politics of Sympathy in Lydia Maria Child's Letters from New York", American Literature 76:4, December, 2004: 749-777. "The Problem of the City," in Shirley Samuels, ed., A Companion to American Fiction 1780-1865 Oxford: Blackwell Publishing (2004), Chapter 25.